We are pretty sure that you will be inspired to see this award winning residence called the Robin’s Way. 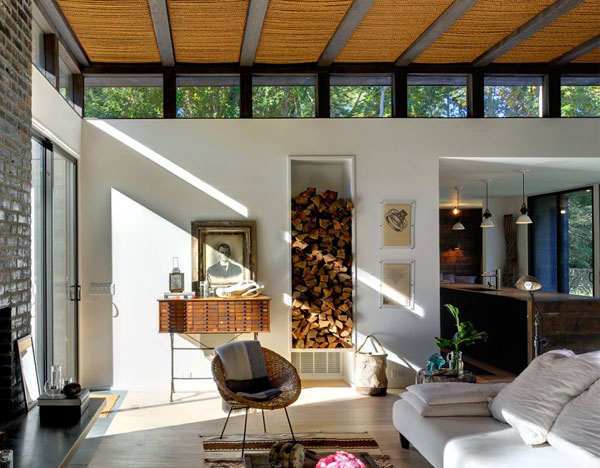 This 2000 square foot home was built on 1.5 acres in Amagasett, New York. It went through a total renovation to make it an enjoyable place for the family. One of the clients of this house is an interior designer making it look even more impressive in the inside. Meanwhile, the clients have collected some photographs of objects as well as other conventional materials that can be used as a fascinating means of inspiration for the design. A particular plan is ought to merge with the old remaining parts of the house to form a latest intervention. This house deals with the aesthetic decoration requirement of the client’s collections of objects. The client wants to retain the history of the home while integrating new developments to it. This house was devastated and reduced the skeletal structure that allows them to use of the existing posts and beams. You can see that between the existing ceiling joists, there is a natural rope woven in a digitally fabricated framework. This natural rope plays a vital role in the interior of the house. Additionally, to show different ceiling conditions they have used the weaving patterns. In fact, the lighting of this house penetrates through a crossed weaved of the rope. It moves to a straight weave to shield its speaker utilities. Now, are you ready to see the different sections of the Robins Way Residence interior as well as the exterior? You may check the images below. Let’s take a glimpse of this stunning house of green exterior with the fantastic swimming pool. As the sliding door opens, it unfolds the sophisticated look of the Masters Bedroom with the inimitable light from the inside. 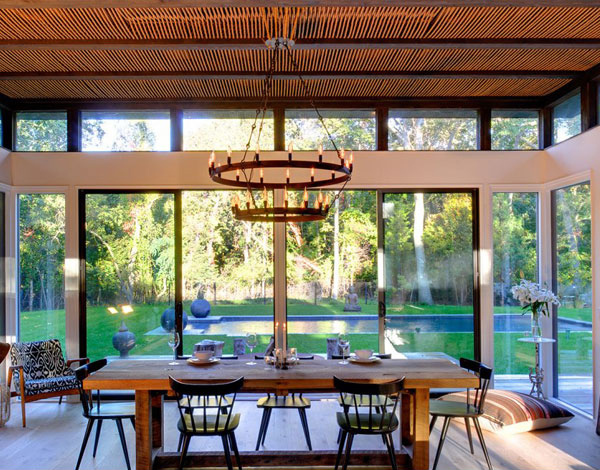 This dining table is perfectly seated in this dining area where you can directly view the swimming pool and the trees outside. In this living room, one can observe the newly built walls and cabinets in the interior which were also resurfaced in reclaimed barn wood. 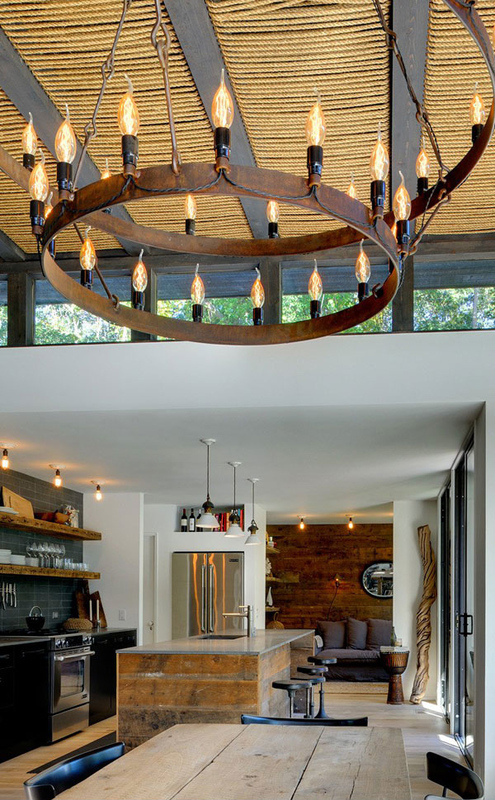 The kitchen area has noticeably shown the rematerialized furniture that adds fashion sense. 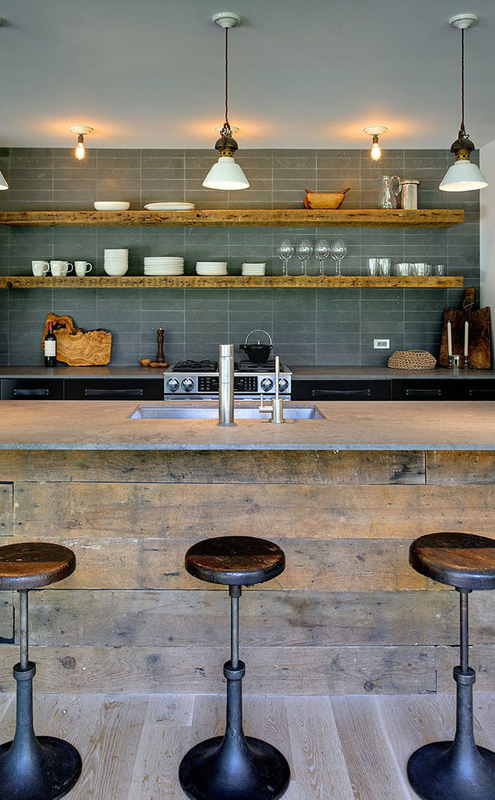 As you take a closer look to the fixtures in this kitchen, you will see that it neat and stylish. 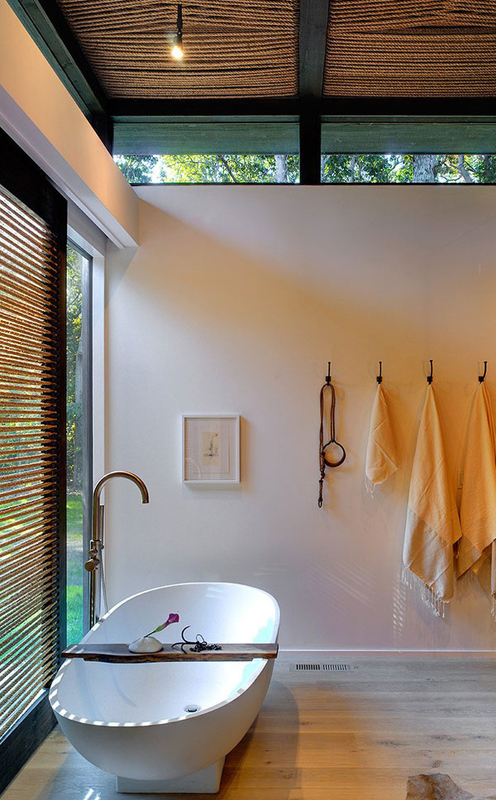 The sunlight rakes through the openings of the casting linear shadows on the bathroom floor. 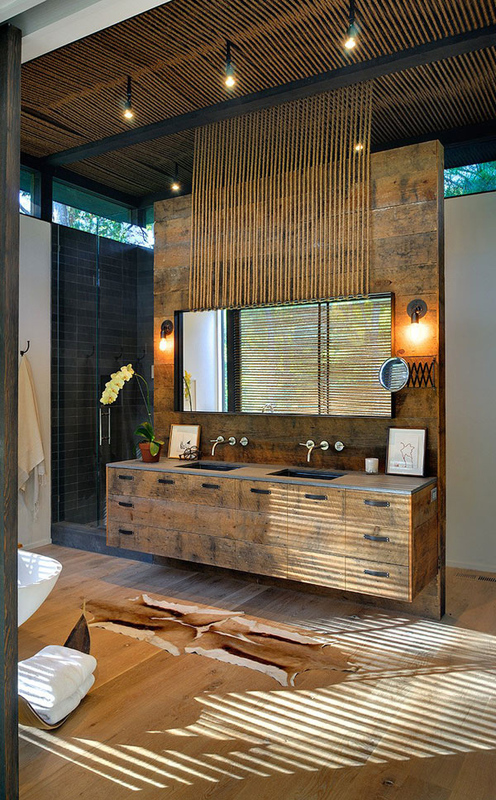 Let’s take a glimpse of how the rematerialized cabinets and walls redecorate this master bathroom. 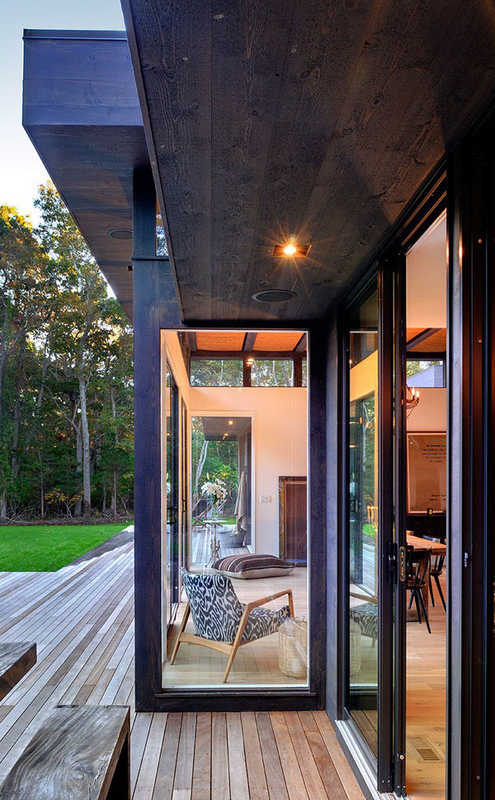 The furniture is flawlessly seen through the glassed walls and doors of this house. Dark stained cedar siding covers all of the exterior facade making it look renewed. The flow of sound is very important in this house because the client is a disc jockey. The said woven rope in this house serves as an acoustic baffle that absorbs the background noise. But it allows the music from the ceiling mounted speakers to be produced. Also in order to provide privacy from the neighbors, a large sliding door is woven with the rope. At the same time, it serves as a protection from the sun in any time of the day. In addition, the rope was used structurally to support the several items in the interior including the large, customized steel frame mirror found in the master bathroom and dining room chandelier. Well, this house was programmed to fulfill the desire of the client, that is, to have a quiet escape from the busy life in the city. This Robins Way Residence is astoundingly designed by the Bates Masi Architects . Even if they preserved the structure of the house, still the conventional materials were used in many ways to merge the old and the new concepts. Thus, we are pretty confident that this house will truly captivate your heart. We hope that this article would be a great help for you to realize how you would come up with your dream house.